How Do I Import My Music Into iTunes? – Soundburst Audio Distributors, Inc.
How Do I Import My Music Into iTunes? Importing music into iTunes is very simple. Once you’ve downloaded and extracted your music, open up iTunes. If you are importing a full set, go to FILE -> ADD FOLDER TO LIBRARY. 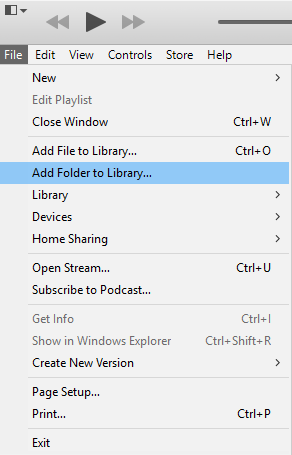 If you are importing a single track, go to FILE -> ADD FILE TO LIBRARY. Then select the location of the music folder or track that you downloaded from us. Your music should now be loaded into iTunes! Next How Do I Extract My Zip File? Previous I Just Added My Music To iTunes, But I Don’t See It! Where did it go?